Behold the Red-Nosed Reindog, a rare creature from a remote mountain region near the North Pole! 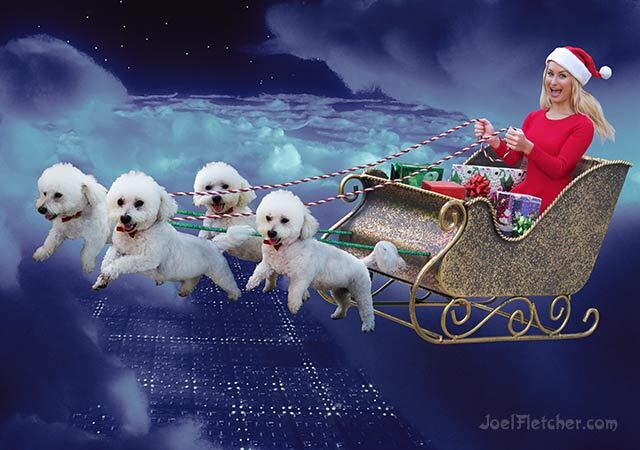 Okay, what you are actually looking at is a surreal photorealistic composite, which I created for the amusement of friends and family as this years Christmas card. 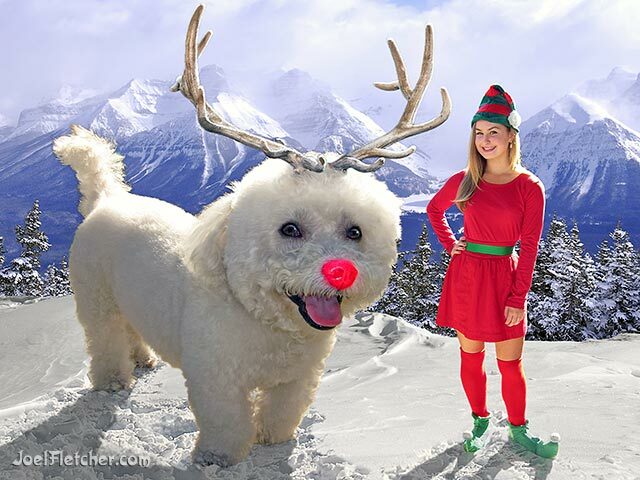 I thought it would be fun to portray my daughter as an elf, and her dog as the iconic Rudolph. Being fairly adept at Photoshop magic, I combined a number of photographs to illustrate this imaginary scene. I started the process by photographing the dog, as she was the focal point and novelty of the image. In reality she stands barely 18 inches high, therefore to simulate her appearance as a big animal I used a wide angle lens and positioned the camera height just above her eye level. I intentionally chose backlit lighting for the artistic effect, using fill flash to control the shadows. 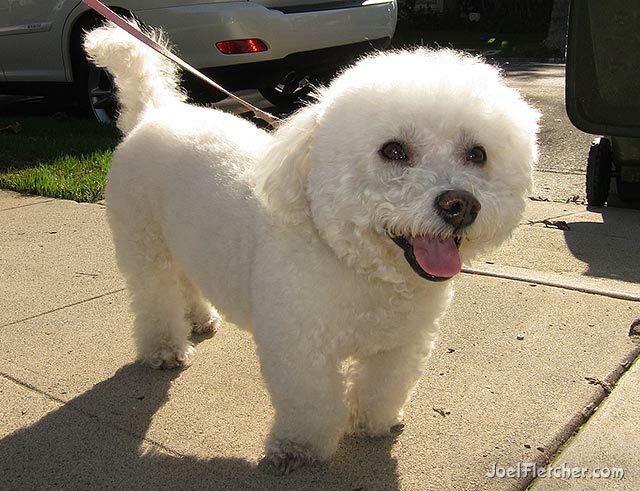 After choosing the best shot of the dog, all other photos used for the composite needed to match it's lighting direction, contrast quality, perspective, and lens angle as much as possible for the most convincing results. With that in mind, I proceeded with the photo session of my daughter in an elf costume. Once I had photos of the main subjects, my next concern was an appropriate winter backdrop. Finding a snowy background where I live in sunny Los Angeles was a problem, so I decided to license some stock images from bigstockphoto.com to help complete the project. With careful searching for photos that fit my vision and had the right lighting, I chose a spectacular mountain background, another mountain scene for the foreground, and one with trampled snow. I also found an elk photo with appropriate horns, although the lighting was completely wrong; but I knew this could be fixed by painting in the backlit lighting. Once I had all the elements that I needed, I laboriously pieced the various parts of the puzzle together in Photoshop. I cut out all the parts "by hand" since this gave me better results than the automated solutions. Using numerous layers, I adjusted the white balance and contrast, tweaked and refined edges, and painted additional details. It was a lot of work, but a really fun and challenging project. Hopefully it will bring a smile to anyone who gazes upon the sight of the Red-Nosed Reindog! 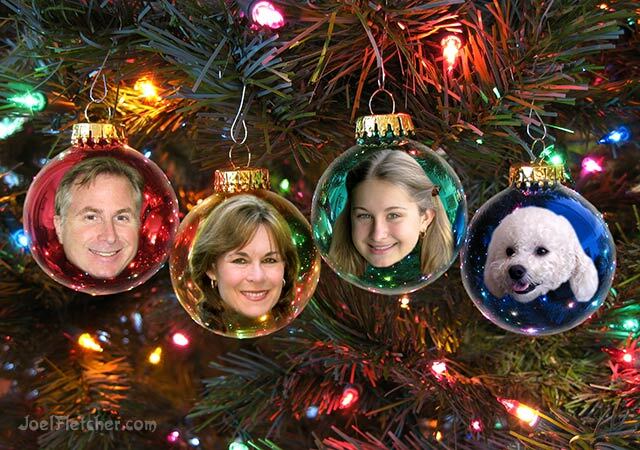 Addendum: More examples of my composite Christmas photos!